Can T10 make cricket a truly global game? While Steve Smith has continued his march towards Bradmanesque greatness at the WACA, quietly, unobtrusively, an experiment was playing out in the midst of the deserts of Sharjah. At the Sharjah Cricket Stadium, six BBL-style teams have been taking part in a four-day competition of 90-minute matches in front of packed stadiums. At the centre of the action have been England’s limited-overs captain, Eoin Morgan, West Indies T20 World Cup-winning skipper Darren Sammy, Sri Lanka’s Test captain Dinesh Chandimal, and Bangladesh captain Shakib-al-Hasan, among others. They are all taking part in the world’s first T10 championship. There could have been no start more dramatic than when in the first match, Shahid Afridi picked up three wickets in successive balls, the final victim being India’s Virender Sehwag, to become the first bowler to take a hat-trick in T10 cricket. With franchise names like Bengal Tigers, Kerala Kings, Pakhtoons, Maratha Arabians, Punjab Legends and the utterly unimaginative Team Sri Lanka, this particular competition clearly caters to the expat community in the Middle East who are starved of good cricket other than Pakistan’s ‘home’ matches at Abu Dhabi. This narrow target market, while ensuring the success of this ‘Masala’ version of cricket as purists would have it, very importantly also provides a safe environment to test run this format with little risk to the immediate plans of the ICC, located a few short miles away in Dubai. With the presence of so many current players in the competition, one cannot but assume that this has the tacit approval of the respective boards (and hence the ICC) who have let their players put in appearances for the various teams. It is an interesting time to experiment with this format. There appear to be at least three birds that can be bagged at one time with this one lob of the proverbial stone into the unknown. First, there is again a lot of discussion about the possibility of cricket being introduced as an Olympic sport. What is clear is that for a cricket to become an Olympic sport, it needs to take take less time and be intensely gripping every moment that spectators watch it. The format must also lend itself to the staging of multiple matches on the same day so that spectators who buy a day ticket get the most bang for the buck. By limiting the time available for each T10 match to 90 minutes, and staging multiple matches on the same day, the Sharjah tournament is going head-on with football for ‘eyeball time’ of viewers. That is surely not a coincidence. Second, it is not a secret that, notwithstanding the 25 days of packed stadiums Australia is currently blessed with for the Ashes, the numbers that show up to witness Test matches around the globe are abysmally tiny. I was in Kolkata recently for the launch of my new book Spell-Binding Spells at the time when the magnificent Eden Gardens was hosting the first India-Sri Lanka Test. Sourav Ganguly had produced a pitch (in preparation for the upcoming tour of South Africa) never before seen in India – it had grass, it had movement and it had bounce. It was beautiful. Surendra Lakmal, Sri Lanka’s medium pacer, had just run through the Indian top order with the spellbinding figures of 6-6-0-3. When I ran up to the top tier of the Eden Gardens clubhouse the next morning (which was Saturday), excited to be there after 20 long years and eager to watch this fascinating contest, there were 1299 other spectators at the ground as per the official count at a stadium with a capacity close to that of the MCG. 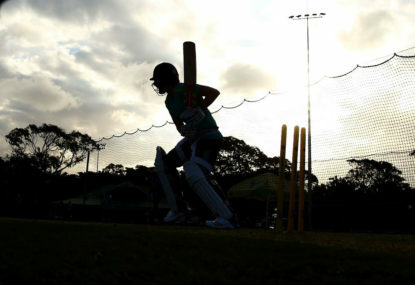 The woes that beset cricket administrators were apparent in no uncertain measure. That evening when I raised the issue with VVS Laxman, who has written the foreword to my book and was launching Spell-Binding Spells with me, VVS responded saying that given how cricket has moved online through live streaming and the commercialism that has followed it, perhaps there is less reason to panic about lack of spectators at Test matches from a financial standpoint. While VVS is a very astute analyst of the game and is deeply involved with various aspects of it, what he highlights is clearly only one side of the story. No sport in the world survives on television and online streaming alone. Cricket is a spectator sport just as football or rugby is. Take the spectator at the ground out of it, and you are left with callisthenics without the emotion. That is not cricket. Third, with T20, the ICC is reaching out as far as they can into countries that have at best a fringe following for the game. While the example of Afghanistan making it to Test status in a short space of time is a good story, it is surely more the exception than the rule. Capturing in the ‘cricket net’ teams made up of expatriates will not take the sport mainstream. On the other hand, creating a 90-minute version of the game that reaches out to the masses has the potential to bring in not only new spectators into the ground, but also new participants into the game as the sport grows in acceptance and interest. Making it an Olympic sport will exponentially expand participation from athletes and countries eager to find a new source for adding another medal to their tally. It is clear that the idea of the T10 format is to get new participants and spectators to the game. By creating a 90-minute capsule format with the associated entertainment that a BBL or an IPL have already mastered, cricket might just have given itself the chance to reinvent itself into a sport that has mass appeal like football. It is worth reminding ourselves that in 2007, when the first World T20 took place in South Africa, India had only ever played one Twenty20. It fell upon a long-haired wicketkeeper called MS Dhoni, who had no leadership experience but plenty of attitude and gumption, to take a team of young hopefuls to compete in a format completely unfamiliar to them, and come back champions of the world. The following year, the IPL would be thrust upon the world and cricket would never be the same again. The purists of the game are vehemently against the T10 format. That is not surprising, and is indeed human. Change is rarely easy to accept. Before one dismisses this as yet another fad that will soon go away, we should at the very least keep an open mind. I suggest that it would take a brave man to bet against a scenario that at Paris in 2024, exactly 124 years after hosts France became the last team to play cricket at the Olympics against Great Britain, history will not repeat itself. Anindya Dutta has recently published his second book, Spell-Binding Spells: Cricket’s Most Magnificent Bowling Spells. You can grab a copy on Amazon.